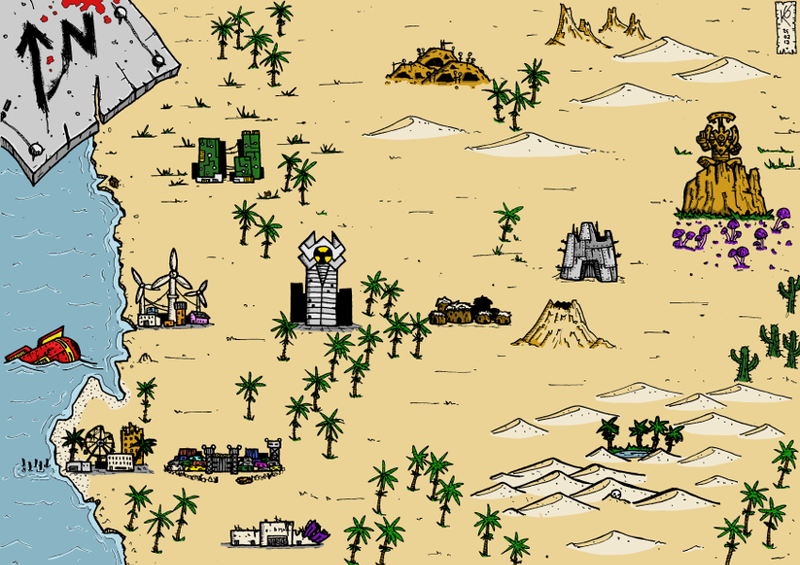 I drew this pointcrawl map for Mike Evans' Barbarians of the Ruined Earth role-playing game project. I am trying not to hate it, as I tend to hate everything I create about five seconds after I finish it. I don't work in colour often, but I don't think this turned out too bad. Up until last week, the last time I played Warhammer 40,000 was in 1997ish. I had a Genestealer Cult army and when the third edition of the game came out Genestealer Cults weren't supported, and I didn't have enough money to start a whole new army, so that was that. I kept up with developments in the game and over the past couple of years I've been collecting and painting classic Eldar miniatures in order to build the army I always wanted but could never afford at the time. Then a couple of months ago Games Workshop announced a new edition of 40K, one that applied some of the lessons learned from the Warhammer Fantasy Battle reboot. The rules seemed to be simpler, discarding much of the fiddly cruft that had built up, and then GW released five low cost army books that covered the entire range of miniatures. I decided to give it a go -- it didn't hurt that the rules are free -- and roped Stuart in, because I was getting the Eldar book anyway and I knew it also included one of Stuart's armies; there's no point playing 40K if you don't have an opponent, after all. Stuart's son Sebastian also wanted to get involved and so we ended up playing a three-way battle. 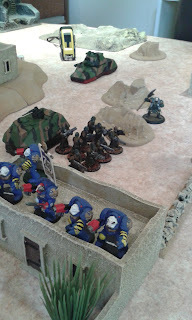 I brought my vintage Eldar, while Stuart dusted off his Necrons, and Sebastian fielded a Dark Angels-Imperial Guard alliance. It was a bit choppy, because even though the new rules are streamlined, the first play of a new game is always a bit wonky. We were all a bit rusty too; Stuart hadn't played 40K in a couple of years, I hadn't played in twenty, and Sebastian had never played at all! 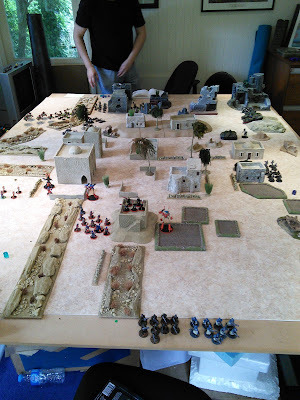 Sebastian set up a nice desert village with a ruined Imperial factory complex on the western edge of the board; Stuart's Necrons deployed in the south-west corner, my Eldar took the south-east-ish corner, while the Imperial forces came in from the north-north-west-ish. We'd each chosen sixty power levels of troops, but I was worried from the start as both opposing armies outnumbered mine. I wasn't too concerned about the Imperial Guard because while they do travel in large numbers they are squishy and easy to kill -- apart from the tanks, but we'll get to that! -- but there also seemed to be an awful lot of Necrons and they didn't exist last time I played so I wasn't sure what to expect. Power levels are one of the new ideas introduced with the eighth edition; while you can still select armies the old way, tinkering with details to get an exact points value, power levels are an off-the-shelf abstract approach that gives you a general idea of a unit's, er, power level, more suited for casual games like this one. It's quick and easy and I like it a lot. The mission was to seize objectives -- the bushy green plants -- and hold them for as long as possible; we'd get a point for each objective we held at the end of a turn. I was lucky as three of the objectives had been placed almost in my deployment zone, and as a result I didn't need to advance much to get into a good position. Not that I had an easy time of it, as Stuart sent his heavy floaty laser cannon dudes in on my left flank early on -- pictured above -- and this tussle lasted almost the entire game. In the centre, my Guardian squad shuffled forward to claim an objective, but not too close, as Sebastian teleported a Terminator squad right in the middle of the table and I didn't fancy tangling with them. I felt most exposed over on the right with a single Dreadnought holding the flank and two squads of Imperial Guard -- plus tank -- rolling forward. 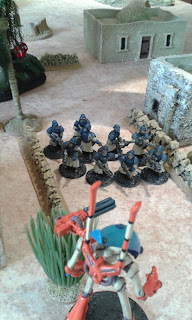 On the plus side, most of the Space Marines were over on Stuart's side of the table, well away from me and my space elves. There was a brief wobble on the right as Sebastian sent both Guard units into hand-to-hand combat with my Dreadnought, but the war machine barbecued most of its opponents with its twin flamethrowers before they could get close. A Space Marine character accompanying the Guardsmen made a nuisance of himself so I pulled the Dreadnought back and then mashed the Marine with concentrated missile launcher fire from my Dark Reapers. After that, Sebastian pulled away from his left flank -- my right -- and decided to concentrate on the battles in the centre and the Imperial factory in the west, where most of his Marines were deployed. This is where the fighting was most brutal, as Stuart threw everything he could at the Guard tanks, to no effect; as it turned out we had made a mistake while writing down the tanks' statistics, and they weren't nearly as tough as we all thought. 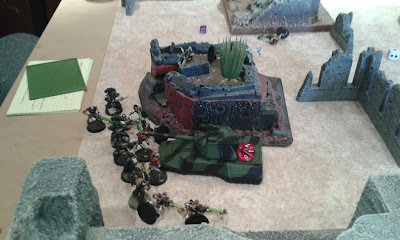 The Necrons were held up for so long trying to destroy the vehicles that it gave the Dark Angels enough time to get stuck in, including the heavy-weapon-toting Devastators who had up until then been jogging towards the fight instead of shooting. With the Necrons fighting both Space Marines and indestructible tanks, and the Eldar being left alone to hoover up objectives on the other half of the table, we decided to halt the game on the fourth turn, rather than let it go on to the fifth. 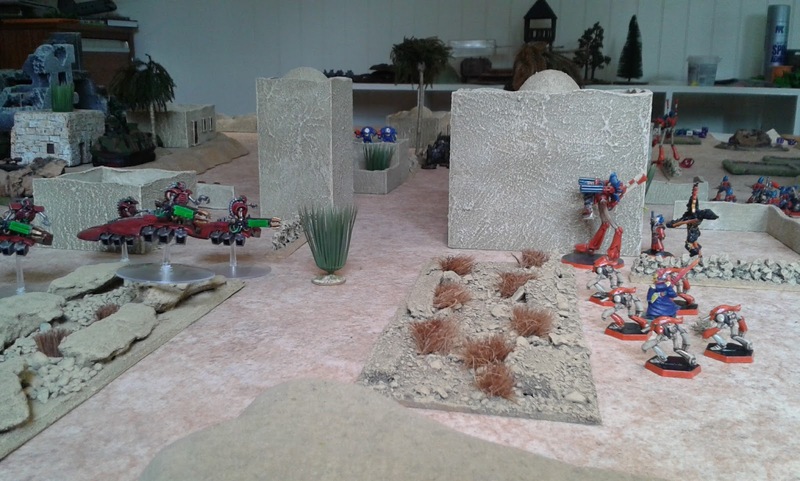 The game ended with a narrow victory for the Eldar on nine objective points, with the Imperial alliance on eight, and the Necrons on seven. I think the placement of the objectives favoured me, as did Sebastian's decision to abandon his left flank and focus on the Necrons. Getting the tank rules wrong also had an effect, I'm sure! Everyone had a great time, and all three of us want to play again. Stuart is thinking of rejigging his army and Sebastian is painting -- or rather is encouraging his father to paint -- more Terminators. I'm going to have a think about my army too; this time, I brought everything I had painted but I have lots of miniatures either gathering dust or soaking in Dettol so I have some options. My War Walker got blasted into bits early on and I don't think it fired a single shot, so I'm thinking of swapping it for a unit of troops to bulk up my numbers a bit, and I'm not sure about the Avatar; he's a bit of a beast but only killed one Necron in the entire battle, instead hanging back to provide a morale boost to the Guardians in the middle. It wasn't the best use of a fiery god of bloodshed. On the other hand I'm happy with how the Guardians performed and with the Eldar being so light on numbers I liked having a big unit to anchor the middle of my line. I also enjoyed having the psychic phase to myself -- the Necrons don't have psykers and the Imperium didn't bring any -- so I'll field Warlocks again next time. 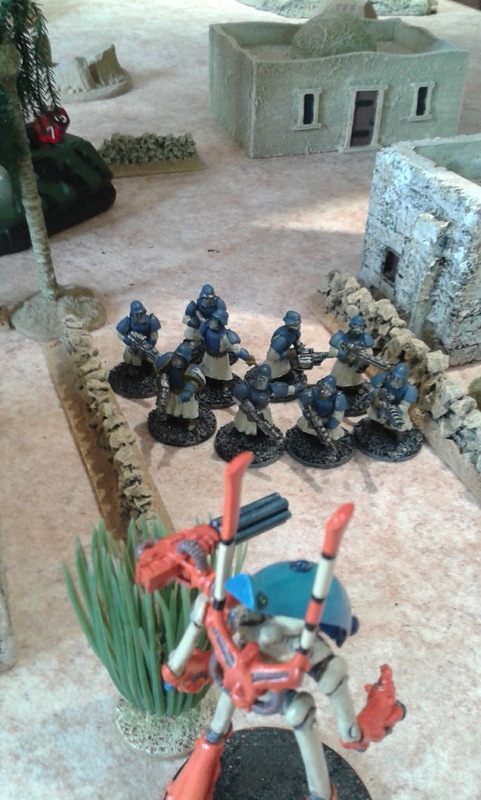 The Wraithguard are brilliant and saw off Stuart's heavy floaty laser cannon dudes, so I'll be bringing them back, and I'll try to get more if I can find the miniatures for a decent price. The Dreadnought also did well and I have two more of them in the painting pile, so it's tempting to bring more for the next battle. The game itself is not bad. It's a bit abstract and I did like the detail of second edition, but I suspect the game would have taken two days if we'd played using those rules! That said, I do like how the core rules are nice and simple with any complexity or exceptions -- and even then there aren't many -- restricted to the individual unit descriptions. It took us most of an afternoon to play four turns but we were learning the game and there were three of us, so I imagine both added to the time; the game itself seemed to run quite fast once we got going. All in all, I think GW has done a good job with 40K8 and I'm keen to give it another try, but I need to get painting! Update: Stuart has blogged about the battle here. When I was around seven or eight I would play Doctor Who in the playground at school. I would play the Doctor and my friend Louise Griffiths would play Mel. We'd make up adventures in which we'd run away from imaginary alien monsters and pretend to fall off cliffs. I'd like to think I was being clever and wise beyond my years but I can't manage that now, so I doubt I did it when I was seven. The programme was more or less cancelled a year or so after that and didn't reappear until 2005 by which time I was twenty-five so I sort of missed that window in which I could have told the careers adviser that I wanted to be an actor, director, or writer so that I could work on Doctor Who. I mean that; if the programme existed during those formative years I probably would have tried to get involved in it somehow. Oh well. That's not a problem the youth of today have. Children watching it when it came back in 2005 are now going to be making their way in the world as young adults and I'm sure there are a few who have decided to become actors or writers or props people or composers because of their love of the programme, and that's brilliant. 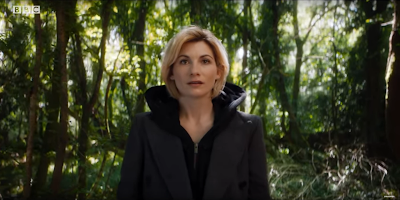 What's not so brilliant is that the girls and young women who love Doctor Who and want to be actors because of it will never get to play the main role. 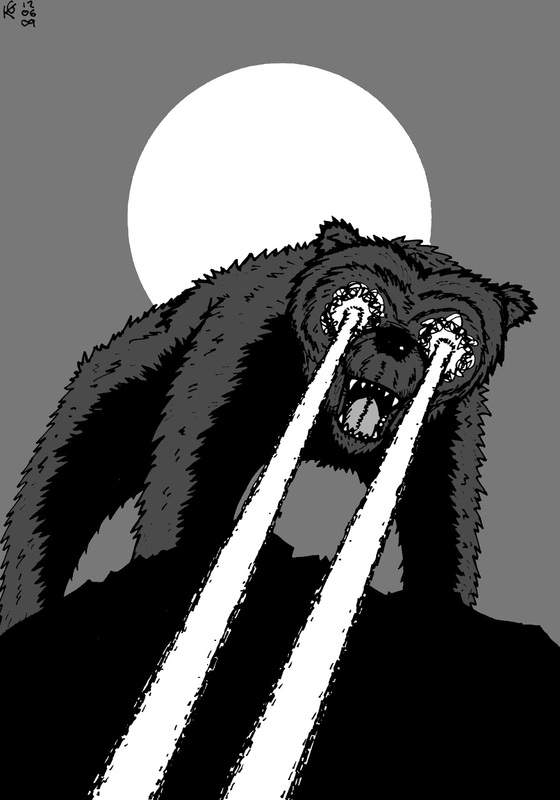 I think the only thing I've seen Jodie Whittaker in is Attack the Block and I remember thinking she was good in that. Well, everyone and everything is good in that; it's ace, but that's beside the point. 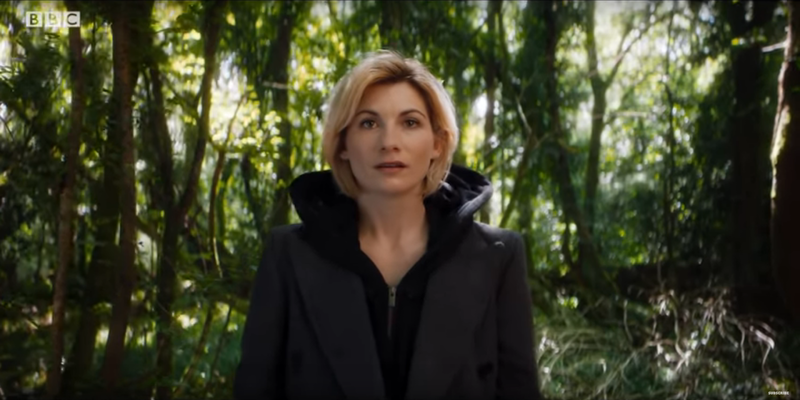 I'm sure she'll be good in the role and I'm keen to see what this new Doctor Who will be like, but it doesn't matter what I think. What matters is that now is that a door has opened and non-male fans of the programme know that they can not only write for it, or direct it, or act in it, but they can also play the lead part. That is, as the Ninth Doctor used to say, fantastic. This is an older one but I don't think I've posted it before and it seemed a shame to miss it out given that a theme seems to be developing. This fine fellow was drawn for Fight On! #6 in 2009. Yikes.